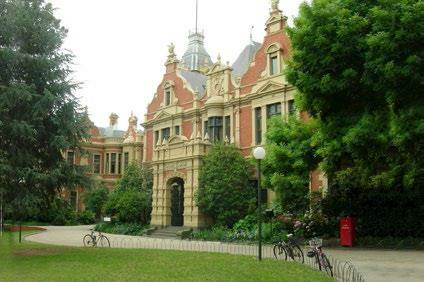 The 1888 Building (Former Teachers’ College) eventuated from talks between the Education Department and Minister for Lands for the establishment of a college for training teachers, beginning in 1877. 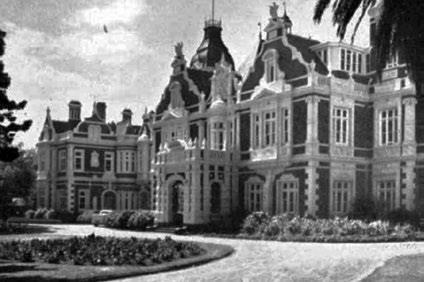 After years of negotiation, the land was eventually handed over from University property to the Education Department in 1887. 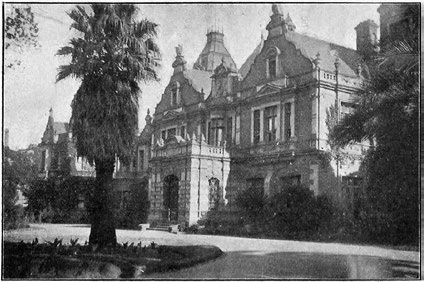 In 1927 the 1888 Building stood as a grand gesture in gardenesque setting to the southeast corner of the University campus. Courtesy State Library of Victoria. Constructed in three stages between 1889 and 1892 by the Public Works Department (PWD, forerunner of the Metropolitan Board of Works), the building became a boarding school for University High School in 1893 after it was leased following government cuts. 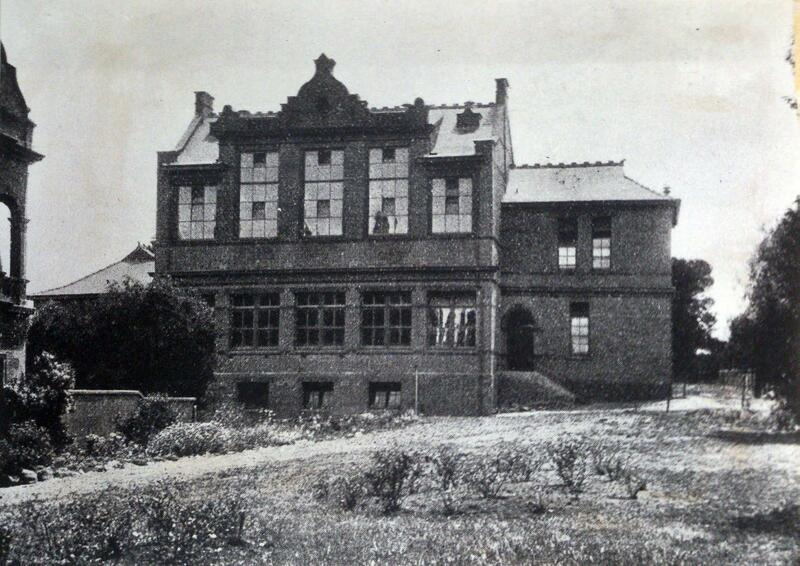 The building returned to the Education Department in 1898, reopening in 1900 as a training institution for teachers. 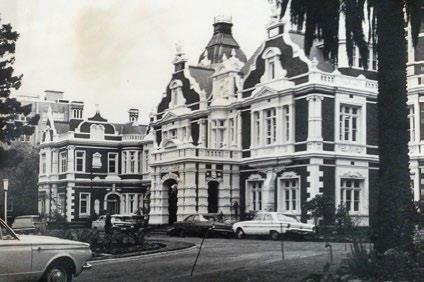 The college and land returned to the University in 1989. Architectural drawings showing the three stages of development of the 1888 Building between 1889 and 1892. 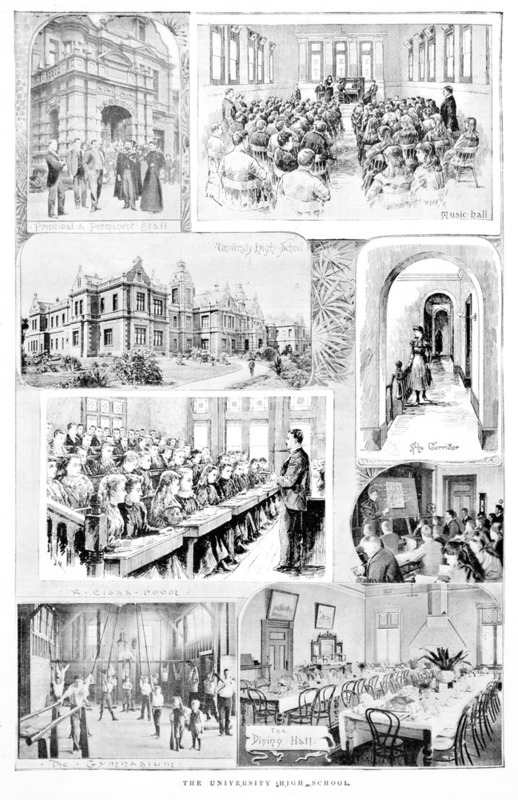 A series of photomechanical reproductions depicting scenes of the 1888 Building during lease to the University High School, 1894. Courtesy State Library of Victoria. This view of the 1888 Building from Grattan Street, taken in 1905 or 1906, shows the building before the maturity of the recently planted trees a magnificent view from the dirt road (Grattan Street). Courtesy University of Melbourne Archives. South-west view towards the 1888 building entrance (labelled then as ‘the entrance drive’), courtesy the Melbourne Teachers’ College Handbook 1929. Late 1950s view towards the entrance showing a well-groomed landscape where the impressive pine tree in the previous image has been removed. Courtesy the Melbourne Teachers’ College Handbook 1957. 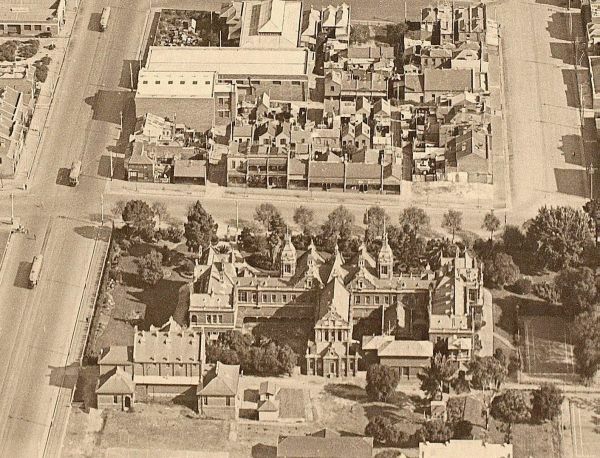 In 1968, the layout of the garden looked very similar, with no indication of significant changes happening north of the precinct. Courtesy Seng Bee Ong, & Kit Ling Chin (Melbourne University 1968 thesis). 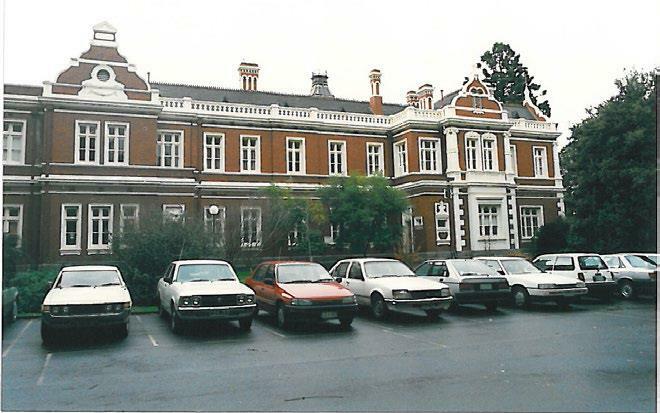 View from 1994 shows the west façade of the 1888 Building showing the parking area north of Gate 8. Photograph courtesy Allom Lovell & Associates Pty Ltd. Contemporary view towards the 1888 building entrance. The Examination Hall (now the Gryphon Gallery) was used for several formal activities including the 1921 final dinner, as shown. Photos of the room today compared to those from 1921, show the remarkable preservation of the room's original features. Images courtesy University of Melbourne Archives. The John Smyth Building was constructed between 1908-1909 by P.W.D., and has been variously called the Science Block and/or Arts Building in its earlier history. By the completion of the building in 1909, sufficient funds weren’t available for furniture and installations; hence occupation of the building was only possible in 1910. 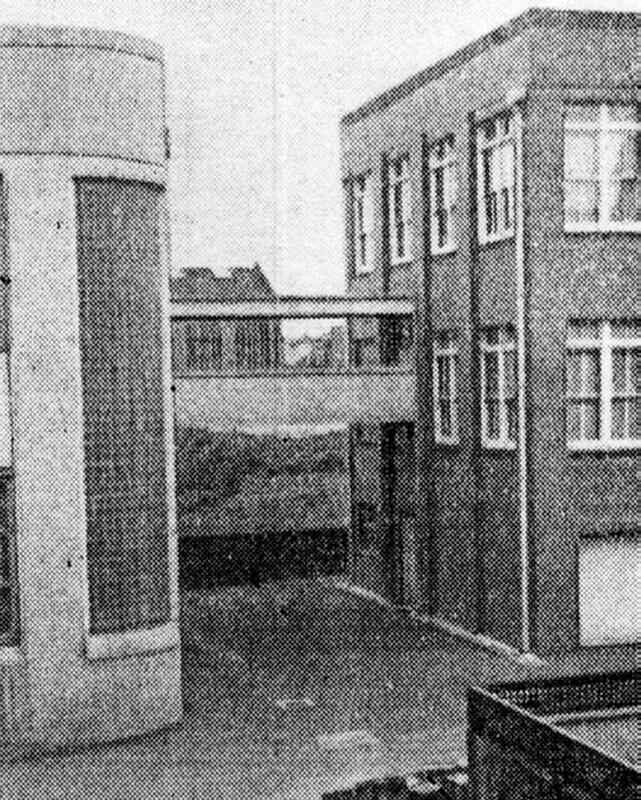 The building was drastically altered towards the west and east in 1943, with a large extension, and a link to the Frank Tate Building via walkway (now demolished). The north of the building was altered in 1995-1996 by Peter Elliot Architects. 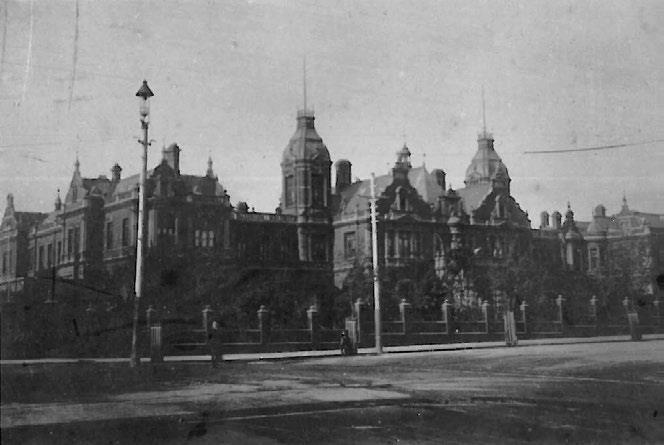 A view of the south facade of the John Smyth building, “...shortly to be opened” in 1909, as described in The Trainee magazine. Courtesy The Trainee 1909. 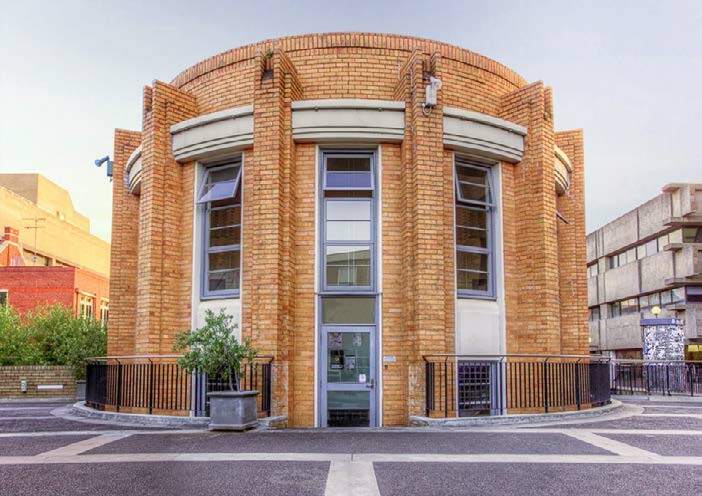 Originally known as the 1939 Building, the Frank Tate Building was built as the Melbourne Teachers’ College Gymnasium and is named after influential Victorian educator Frank Tate, College Principal and subsequently Director-General of Education in Victoria (1863-1939). 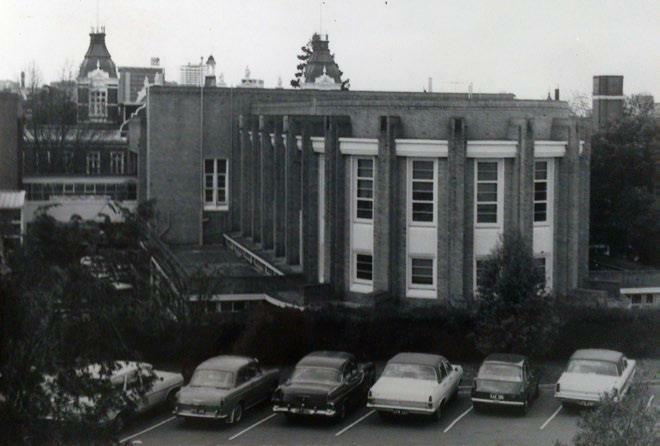 The building was designed and built in 1939 to 1940, by Public Works Department architect Percy Everett. It is a solid example of the Streamline Moderne Architecture style which borrows from Deco influences. Existing view of the Frank Tate Building from the elevated plaza towards the first level semi-circular facade. 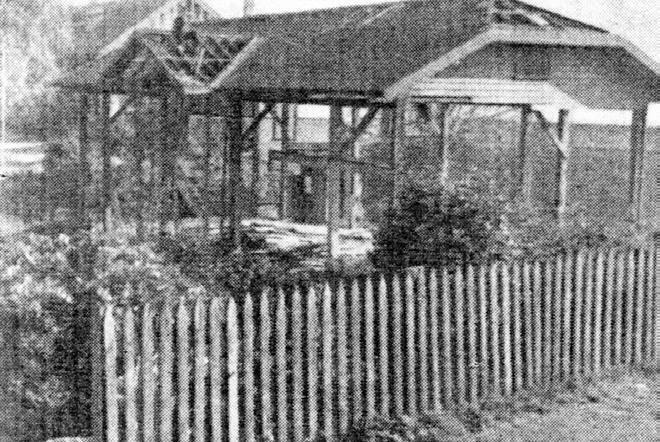 The old timber gymnasium (towards the north of the 1888 Building) was demolished in 1938 to make way for the new Frank Tate Building. Courtesy The Trainee magazine, December 1940. The new dormitory and arts block, “to be completed in the near future”, as seen with this rendering by PWD Architect Percy Everett dated 1939. Courtesy Edward Sweetman, History of Melbourne Teachers’ College. 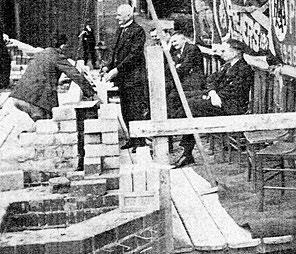 The foundation stone of the Frank Tate Building was set on the 27 of September 1939, by Sir John Harris. Courtesy The Trainee magazine,1940. 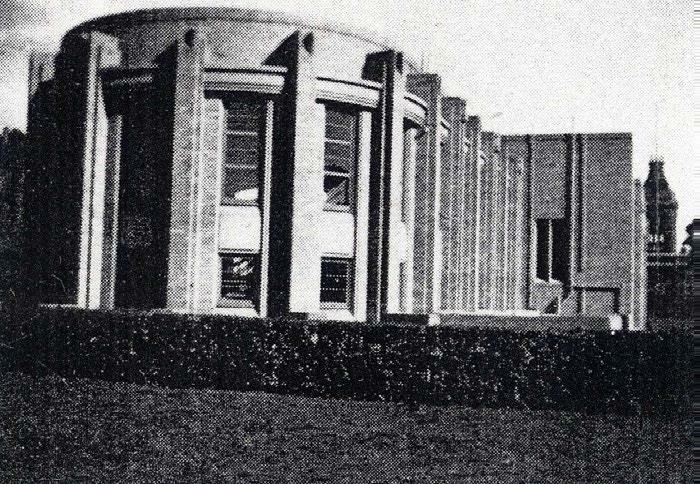 A view of the 1939 Building shortly after completion in 1941. Courtesy The Trainee magazine, December 1941. A rare image of the skyway which once connected the Frank Tate Building to the neighbouring John Smyth Building. Courtesy of The Trainee magazine, 1943. Elevated view south towards the Frank Tate Building, taken in 1968. Notice the skyway connection to the John Smyth Building, shown left. Courtesy Seng Bee Ong, & Kit Ling Chin (Melbourne University 1968 Thesis). 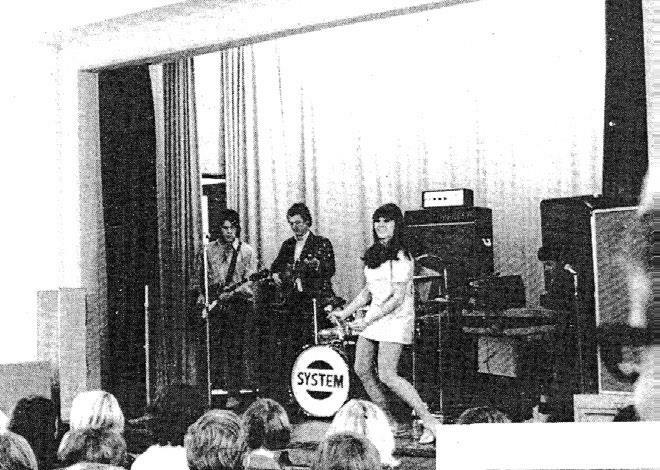 A performance by Denise Drysdale in the Frank Tate Building Lecture Hall, late 1968. Courtesy The Trainee magazine, 1968. The Eastern Resource Centre was originally known as the Teachers’ College Library Block, and was designed in 1968 by Eggleston Macdonald & Secomb Architects, with the Public Works Department under Chief Architect D. C. Bradbury. The E.R.C. is a notable example of late 1960’s Brutalist architecture in Melbourne. The era is dominated by bold concrete and brick buildings which flaunt structure and form; expressed with the E.R.C. via concrete modular panels with interlocking corners along the upper floors. 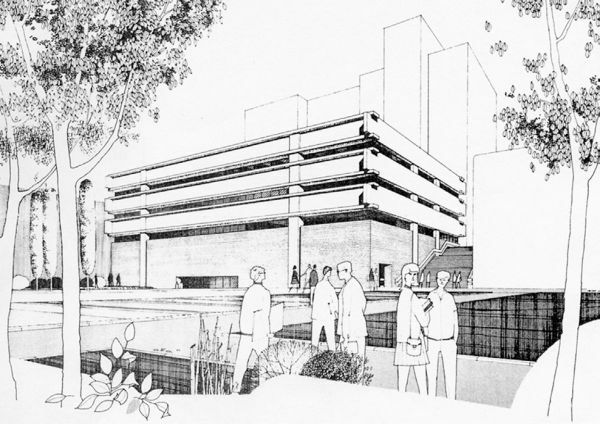 A 1968 architect’s render of the proposed Education Resource Centre (later known as the Eastern Resource Centre); in the background is the outline of the Science wing; the Frank Tate Building outline is to the right (notice the major steps). CourtesyThe Trainee magazine, 1968. Lovell Chen, Heritage Documentation, Main Campus Building Data Sheets, 2010. Allom Lovell & Associates, The Former Melbourne Teachers’ College Conservation Management Plan, 1994. Lovell Chen, Conservation Management Plan- Frank Tate Building, 2006. Swannson, Richard. Percy Edgar Everett, Undergraduate Thesis, Faculty of Architecture, Planning & Building, University of Melbourne, 1968. Goad, Philip and Tibbits, George. Architecture on Campus: A guide to the University of Melbourne and its Colleges, Melbourne University Press, Carlton, Vic, 2003. Chin, Kit Ling & Ong, Seng Bee. Melbourne Teachers’ Training College, Undergraduate Thesis, Faculty of Architecture, Planning & Building, University of Melbourne, 1968. Sweetman, Edward. History of Melbourne Teachers’ College and its predecessors, Melbourne University Press, Melbourne, 1939.